Explore portrayals of the underground railroad, past and present. This panel considers a variety of portraits of the underground railroad, paying special attention to why it is such a durable metaphor in American memory. 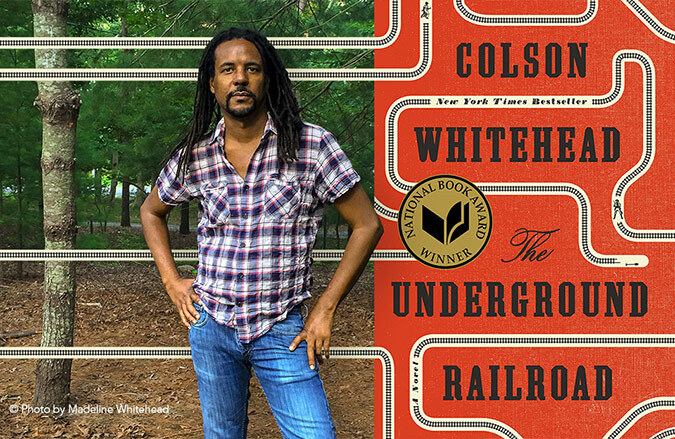 It is part of the annual citywide Memphis Reads program, whose 2018 book selection, The Underground Railroad by Colson Whitehead, imagines the the underground railroad as a literal railroad to different racial regimes in a fictional antebellum American South. Sponsored by: Marcus W. Orr Center for the Humanities, University of Memphis African and African American Studies, University of Memphis African American Literature Concentration, Memphis Reads, International Paper, and Follett. This project is funded under a Grant Contract with the State of Tennessee. It is also funded in part by a grant from South Arts in partnership with the National Endowment for the Arts and the Tennessee Arts Commission. For more information, go to www.memphisreadsbook.org. 13th is a 2016 American documentary by director Ava DuVernay. The film explores the "intersection of race, justice, and mass incarceration in the United States;" it is titled after the Thirteenth Amendment to the United States Constitution, which freed the slaves and prohibited slavery, with the exception of slavery as punishment for a crime. DuVernay contends that slavery has been perpetuated in practices since the end of the American Civil War through such actions as criminalizing behavior and enabling police to arrest poor freedmen and force them to work for the state under convict leasing; suppression of African Americans by disenfranchisement, lynchings and Jim Crow; politicians declaring a war on drugs that weigh more heavily on minority communities and, by the late 20th century, mass incarceration of people of color in the United States. She examines the prison-industrial complex and the emerging detention-industrial complex, demonstrating how much money is being made by corporations from such incarcerations. 13th has garnered acclaim from film critics. It was nominated for the Academy Award for Best Documentary Feature at the 89th Academy Awards, and won the Primetime Emmy Award for Outstanding Documentary or Nonfiction Special at the 69th Primetime Emmy Awards. Colson Whitehead will host a Community Conversation at Rhodes College. A book signing will follow. Colson Whitehead will discuss his book, The Underground Railroad, and host a Q & A session at Christian Brothers University. A book signing will follow. Dr. Martin Luther King, Jr. was a key leader of the nonviolent movement and a founder and leader of the Southern Christian Leadership Conference, which organized many of the South’s effective civil rights campaigns. While King and the SCLC were important in the civil rights movement, activists started campaigns independently. In Memphis during the early 1960s, protestors started legal battles over bus, library and park desegregation and staged direct action protests in downtown Memphis. King became involved in the movement in Memphis in early 1968 when striking sanitation workers asked him to speak on their behalf. An assassin killed him in downtown Memphis on April 4, 1968, days before he was to lead a nonviolent march. Fifty years after this tragedy, we remember his dream. Remembering the Dream tells the chronological story of the Civil Rights movement depicted by Ernest Withers’ I Am a Man portfolio. The exhibit will display ten photographs by Withers, on long-term loan to the Pink Palace, with interpretive panels accompanying the images. Also on display will be an original I AM A MAN placard, dropped after the march, as well as other Civil Rights-era artifacts such as a flyer from the August 28, 1963, March on Washington, a cover letter from the Memorandum of Understanding with the City of Memphis addressing the workers’ complaints, and a paystub showing dues paid by a union striker. The major focal point of the exhibit is a mural of Withers’ iconic I AM A MAN photograph repeated around the gallery walls. Memphis Reads is screening the 2013 film, The Book Thief, hosted by the Benjamin L. Hooks Library. Daniel Unowsky, Professor and Director of Graduate Studies in the Department of History at U of M will give an introduction prior to the movie. September 17, 2017 • 2:00 p.m.
Markus Zusak will discuss his New York Times bestselling book The Book Thief and host a Q & A session at Rhodes College. A book signing will follow. September 12, 2017 • 6:00 p.m.
Shelby County Schools will host a Talk and Q & A with Markus Zusak organized by Facing History and Ourselves. Time and Location are TBA. Markus Zusak will discuss his New York Times bestselling book The Book Thief and host a Q & A session at the University Theater on the CBU Campus. A book signing will follow. September 12, 2017 • 7:00 p.m.
Memphis Reads author Jesmyn Ward will participate in a Q&A the night following her book talk and signing on September 28th at Rhodes College. The conversation will be preceded by a reception at 5:30 p.m. After some opening remarks, Jesmyn Ward will participate in an open, free question and answer session at 6 p.m.
Join the Memphis Reads community on Wednesday, September 28 to hear from the 2016 featured author, Jesmyn Ward! Panel discussion on the meaning and impact of Hurricane Katrina. In conjunction with Memphis Reads 2016 book choice Salvage the Bones by Jesmyn Ward focuses on the days before the storm hit in a poor, rural African American community on the Mississippi gulf coast. Free Screening: "Beasts of the Southern Wild"
Please join Memphis Reads and the Memphis Public Library for a free screening of Benh Zeitlin's 2012 film about a family, surviving Hurricane Katrina, and the depths of human struggle on Monday, September 19! Free Screening of Spike Lee's "When the Levees Broke—Parts I and II"
Spike Lee’s documentary about Hurricane Katrina provides a searing lens into the hours leading up to the storm and the personal experiences of the devastation that followed. This event is organized in conjunction with Memphis Reads, whose 2016 book choice Salvage the Bones by Jesmyn Ward focuses on the days before the storm hit in a poor, rural African American community on the Mississippi gulf coast. Join the National Civil Rights Museum for a reception on Purchased Lives: New Orleans and the Domestic Slave Trade, 1808 -1865. This exhibition will examine those involved in the slave trade and considers New Orleans' role in this era of U.S. history. The Booksellers at Laurelwood and Christian Brothers University are thrilled to present a Memphis Reads Event featuring author Erik Larson on April 15th! Larson is perhaps best known for best-selling books like The Devil in the White City and In the Garden of Beasts. Join Memphis Reads for the climactic event of the month to hear from author Dave Eggers and "What is the What" protagonist Valentino Achak Deng! After the lecture Dave Eggers will hold a book signing for guests. This event is free and open to the public! Join Rhodes College and Memphis Reads for a program with Sudanese Lost Boy Valentino Achak Deng, whose life has been documented by Dave Eggers in his book What is the What. Deng, one of the so-called "lost boys" of Sudan, left Sudan during the civil war and ended up a refugee in the United States. Deng will be participating in an open Q&A at Hardie Auditorium at Rhodes College at 6pm on November 4th following a reception which will begin at 5:30pm. This event is free and open to the public. For more information on Valentino, check out . Film Screening of "The Good Lie"
Join Memphis Reads at the Memphis Library and Information Center for a free screening of the 2014 film The Good Lie, a movie based off the stories of Sudanese lost boys like What is the What protagonist Valentino Achak Deng. After the movie there will be a Q & A with Stacey Hydrick and 'Lost Boy' Joseph Atem.